NEWLY RESTORED AND EXTENDED BARN WITH 3 ACRE PADDOCK. Newly completed a stunning four bedroom detached barn, greatly extended to provide a very unique and highly appointed home combining original features with modern contemporary architecture and high quality fixtures and fittings. Located in a rural setting with far reaching views to the front towards The Vale. Impressive reception hall with oak, glass and steel staircase to a high galleried landing, luxury bespoke kitchen with Miele appliances, a splendid dining room and lounge with far reaching views, bedroom and luxury shower room, first floor master suite with balcony and en-suite, main landing with two bedrooms and luxury bathroom. Detached double garage, landscaped gardens and paddock. The owners have spent several years restoring and greatly extending a traditional stone barn to create a beautifully appointed family home. They have combined many original features with exposed stone walls and beams internally with a very high specification which has included bespoke high performance double glazed oak framed windows, full depth and floor level in part and with a five section bi-fold doors to the lounge opening for access to the covered patio and gardens beyond. It has high levels of insulation with new under-floor heating to the ground floor, an extensive electrical system with concealed lighting to the hall, bespoke kitchen fitted with Miele appliances and three luxurious bathrooms with Bentley & Ashton suites. The gardens have been designed for low maintenance with shaled pathways decked areas with integrated lighting in part, a wide gravelled parking area and a new large detached double garage. The paddock is located to the opposite side of the minor road and extends in total to about 3.05 acres. Bontuchel is located some 3 miles from the market town of Ruthin providing an excellent range of facilities to include primary and secondary schools and good road links towards Mold, Chester, Wrexham and the motorway network. 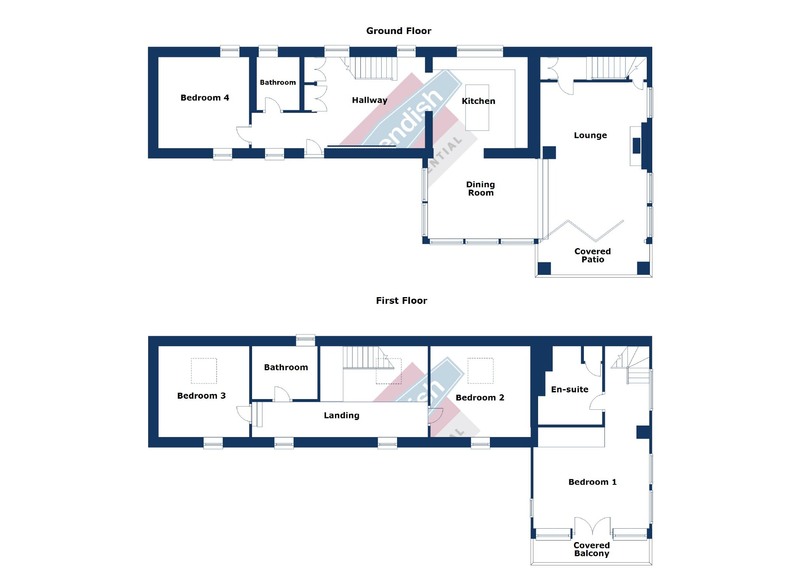 With high vaulted ceiling with impressive feature exposed stonework to one internal gable. Contrasting areas of white walls with concealed mood lighting, bespoke and fine steel, solid oak and glass sided staircase rising to a galleried landing with glass balustrade, fitted cloaks cupboard with alarm system and further cupboard with a manifold for the under floor heating system. High vaulted ceiling with exposed beams and downlighters, engineered oak floor, which extends into an inner hall area, and bespoke oak framed double glazed windows. Archway to the kitchen. Bespoke kitchen with a light cream high gloss finish to door and drawer fronts and contrasting riven light granite working surfaces to include a large central dais which incorporates Miele induction hob, large central stainless steel extractor hood and light over, two Miele integrated ovens and plate warmer, two fridges, freezer and dishwasher. Interesting fitted cabinet to one wall in contrasting charcoal grey high gloss door and drawer fronts with sliding doors to providing pantry. Riven slate floor which extends into the adjoining dining area, feature exposed stonework to the majority with arched oak framed window to the rear elevation. A splendid light and airy room with full depth windows to two sides from which there are truly delightful views in a northerly direction across farmland and the valley of the River Clywedog towards the Clwydian Hills. Riven slate flooring, ceiling downlighters and wide oak topped step leading down to the lounge. A natural extension of the dining area, also with three full depth windows and a five section full depth bifold door opening to a mainly covered decked area. Ceiling downlighters, raised hearth with a STUV contemporary multi-fuel fire grate on a raised slate hearth, enclosed understairs cupboard and enclosed staircase rising to the master suite. Two double glazed windows, ceiling downlighters and feature stone stonework in part. Luxury suite comprising low level shower with an almost full height glazed screen and an integrated monsoon style shower head, modern wall mounted basin and floating wc. Both the walls and the floor throughout are to a Travertine style. Mirror fronted medicine cabinet and a chrome towel radiator. (to include stair well) A spectacular room designed to take full advantage of the far reaching views towards the Clwydian Hills, with a high vaulted ceiling with exposed purlins, almost full height glazed doors with matching panels to either side in a splendid oak frame opening to a balcony with glass balustrade and oak boarded floor. The bedroom has three further floor depth windows which provide a high degree of natural light. A deep fitted recess ideal for wardrobes, wall light points and panelled radiator. An Ashton & Bentley suite with a oval shaped freestanding bath with pillar tap, separate walk-in floor level cubicle with glazed screen and high output monsoon style head, fitted wash basin and low level wc. The majority of walls and floor are in a Travertine style tile with exposed stonework in part, high vaulted ceiling with downlighters, fitted cupboard with high pressure cylinder, extractor fan and a chrome towel radiator. High vaulted ceiling with exposed beams and downlighters, it is well lit with three windows and velux roof light. Concealed mood lighting, engineered oak floor and panelled radiator. High vaulted ceiling with an original 'A' frame truss, exposed stonework in part, velux roof light, further window to the front with far reaching views and a panelled radiator. High vaulted ceiling with exposed rafters, velux roof light and low level window. Exposed stonework in part and radiator. Luxury white suite with an Ashton & Bentley shaped oval freestanding bath with chrome pillar tap and shower head, separate walk-in shower with glazed screen and a monsoon style high output head, floating cabinet with oval bowl and matching wc. Mainly tiled walls and floor to a Travertine style, mirror fronted medicine cabinet, extractor fan and a chrome towel radiator. The house stands within grounds of about 0.2 Acre. It is approached over a concrete driveway with four-bar gate leading to a wide gravelled hardstanding providing turning and ample parking, and access to the detached double garage. An over-sized detached double garage faced in stone with a pitched slate roof with two timber double doors to the front, electric light and power installed together with alarm system and a new oil fired condensing boiler which, through underground piping, is connected to the domestic hot water system and heating system to the house, where there is underfloor heating to the ground floor and radiators at first floor level. The gardens have been designed for low maintenance with shaped lawn, established borders with young fruit trees, barked and slated areas and a wide decked area with integrated lighting to the front elevation. The paddock located to the opposite side of the adopted lane. It has a gated entrance leading in and provides a sloping parcel of land, all within a ring fence and laid out to permanent pasture. From the Agent's Ruthin Office proceed across the square, down Clwyd Street, and on reaching the junction with Mwrog Street bear left. Continue directly across the mini roundabout into Llanfwrog and on passing the Cross Keys Inn take the first right signposted Bontuchel and Cyffylliog. Follow the road up the hill and thereafter proceed beyond the turning for the Woodlands Hotel and follow the road down the hill towards Bontuchel. The Barn will be found on the right denoted by the Agents board.